The most distant spacecraft from Earth, Voyager 1, is executing a series of roll manoeuvres, proving the 33-year-old explorer is in great shape. The extraordinary Voyager 1 spacecraft is demonstrating its nimbleness more than 30 years after leaving Earth. At the astonishing distance of 17.4 billion km, the Nasa probe is the most far-flung object made by humans. But it seems age and remoteness are no barriers to this veteran explorer. Voyager is executing a series of roll manoeuvres to get one of its instruments into the optimum position to measure particles sweeping away from the Sun. Controllers at the US space agency's Jet Propulsion Laboratory in Pasadena, California, report a perfect response from the probe. "I liken Voyager to an old car," said project manager Suzanne Dodds. "It's got simple electronics, not a lot of fancy gadgets - but because of that it can operate for longer; it's not as finicky." Voyager 1 was launched in 1977 on a tour of the outer planets. Since completing that mission, it has been making the push for deep space. The probe is heading in the general direction of the centre of our Milky Way Galaxy and will, in the next few years, leave the space dominated by the influence of our Sun and enter the province between the stars - interstellar space. 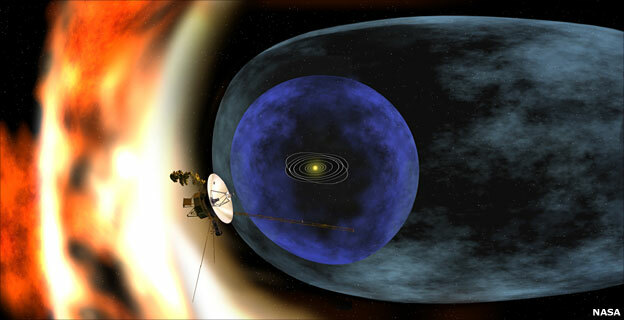 Scientists know that to be the case because of the way the solar wind is behaving at Voyager's current location. This stream of charged particles forms a bubble around our Solar System known as the heliosphere. The wind travels at "supersonic" speed until it crosses a shockwave called the termination shock. At this point, the wind then slows dramatically and heats up in a region termed the heliosheath. Voyager has determined the velocity of the wind at its location has now slowed to zero. Very simply put, Voyager has reached the domain where the solar wind is starting to turn back on itself as it pushes up against the particles of interstellar space. The new manoeuvres are designed to enable Voyager 1's Low Energy Charged Particle (LECP) instrument to investigate precisely what is going on around it. "It counts the particles and measures their direction," explained Suzanne Dodds. "This will give us a much better picture of what's happening with the solar wind close to the heliopause (the "official" edge of the Solar System). It could be that as we do these measures we see its direction change. All we have out there is models and every time we get data the models don't quite fit what Voyager sees, and then we have to update the models." On Monday this week Voyager rolled 70 degrees anticlockwise as seen from Earth from its normal orientation. It held the position by spinning gyroscopes for two hours, 33 minutes. The veteran last performed such a manoeuvre in 1990 when it took pictures of the planets it was leaving behind. Once complete, Voyager rolled back and locked on to its guide star, Alpha Centauri. Voyager 1 will do more roll-and-holds this week, and if the spacecraft continues to function well it will execute a series of weekly rolls to gather particle data every three months. The Voyager 2 spacecraft which was also launched in 1977 is not quite as far from Earth. It is a mere 14 billion kilometres away. At these great distances, communication with the probes is a lengthy business. The one-way travel time for a radio message to get to Voyager 1 is now 16 hours. Suzanne Dodds commented: "People love Voyager I think because the mission has lasted so long. We're still talking to it and it's just so far out in space; people have a real attachment to it. It did its grand tour past the planets and it just goes on, on this voyage of discovery."